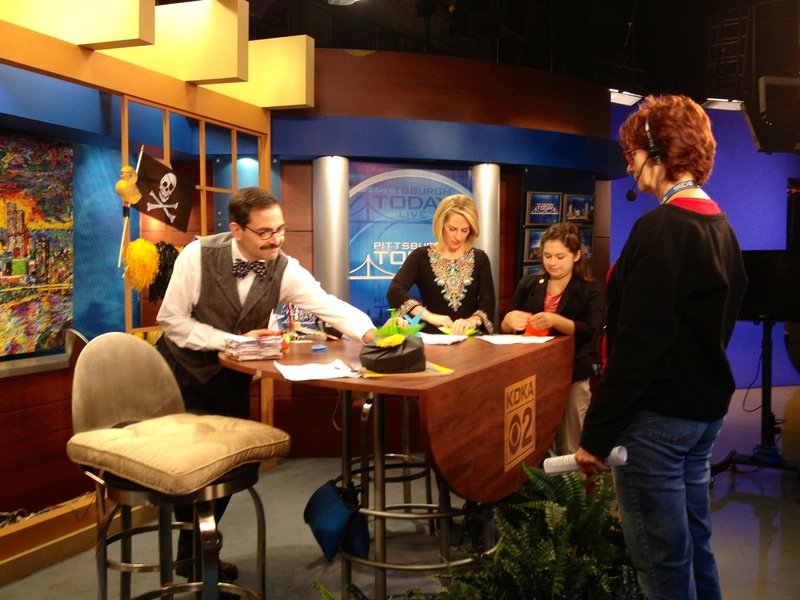 Calista Frederick-Jaskiewicz Folds For Good; Teams Up With Carnegie Science Center on KDKA-TV, Pittsburgh Today Live! Dennis Bateman of the Carnegie Science Center and I dropped by Pittsburgh Today Live! to talk about my ongoing Folding for Good Exhibit at the Science Center. Host Kristine Sorensen immediately made us feel welcome for our nine on-air minutes! 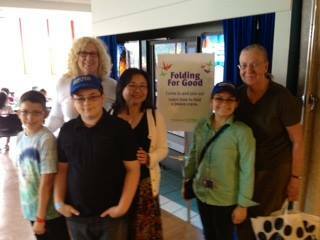 Video here: Folding For Good Teams Up With Carnegie Science Center. 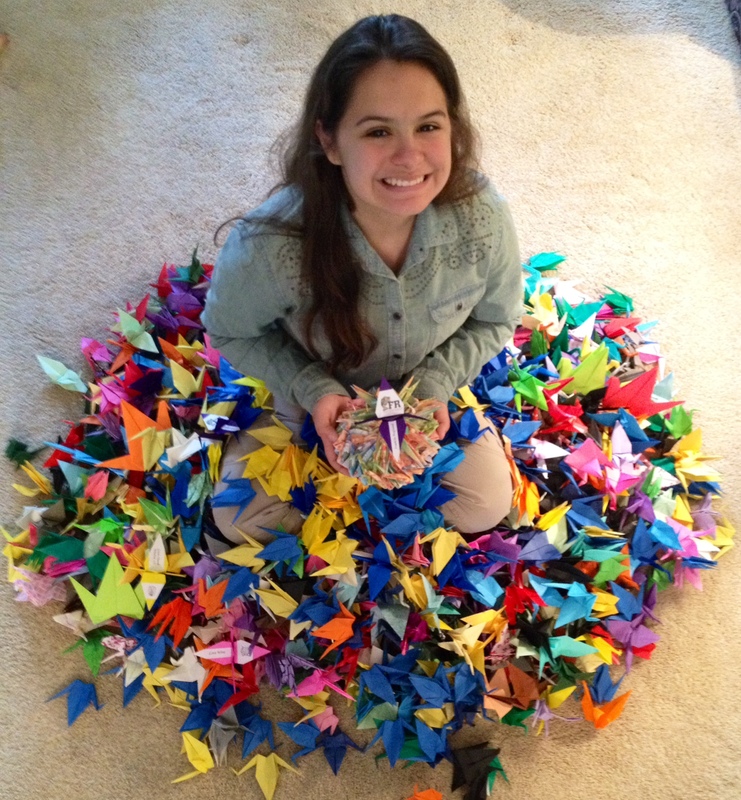 5,050 of the 10, 000 origami peace cranes collected from people in 13 countries through our initiative Operation Sandy Hook: Peace are on display at the Science Center in the three story windows of the Omnimax lobby area from October 3 through November 3, 2013. You can see them from Heinz Field across the street! 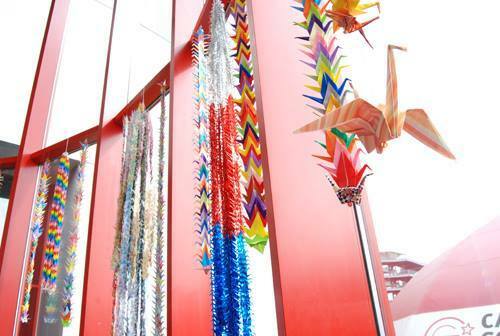 Five of the Omnimax windows are full with crane senbazuru, cascades, and strung strands. The cascades and senbazuru (1,000 strung cranes) are from Origami for Africa, Cape Town, South Africa; Japan; Kimi Ego and Family, CA; Owen Byrne, President, Folding for Good 9, Ridgewood, NY and a large cascade representing hundreds of individuals from around the world who contributed cranes—special mention to Sydney Perrine, President, Folding for Good 10, Melbourne, FL, for creating the oversized dangling crane on this one! 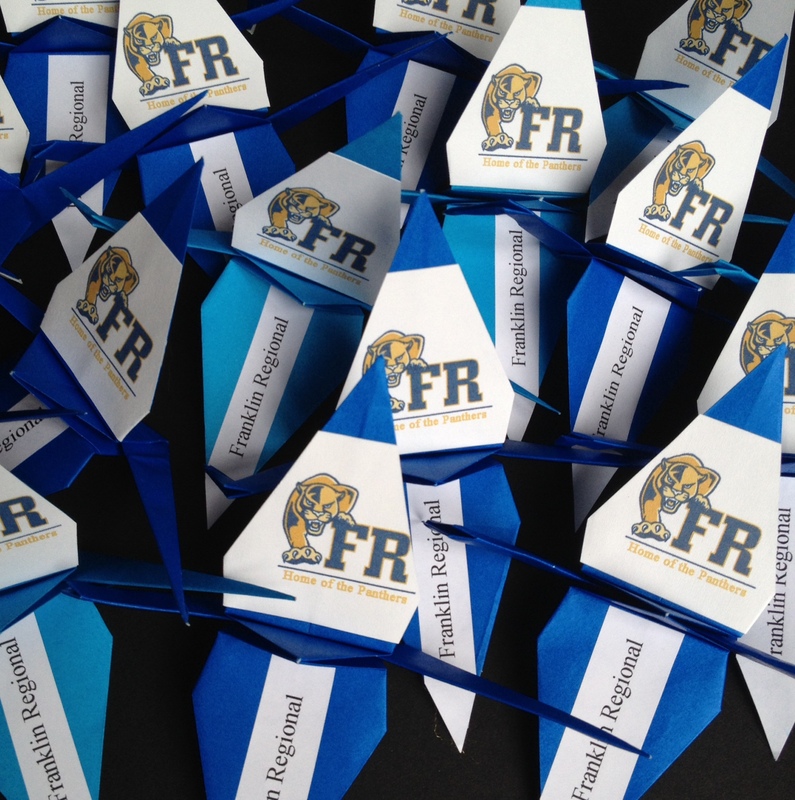 Most of the single strands represent efforts of the numerous folders who participated, but two of them were folded in their entirety by Nathan Boerner, President, Folding for Good 2, Cincinnati, OH, and Seb Tabares, President, Folding for Good 5, Denver, CO. Most of the cranes in the exhibit were sent in loose, so we enthusiastically set about stringing them here in Pittsburgh! 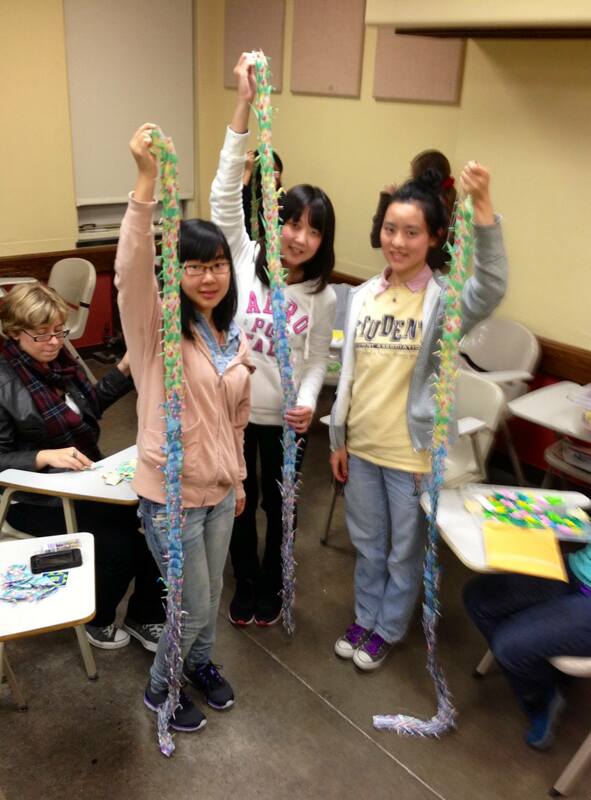 Thank you Origami Club of the University of Pittsburgh for helping out. 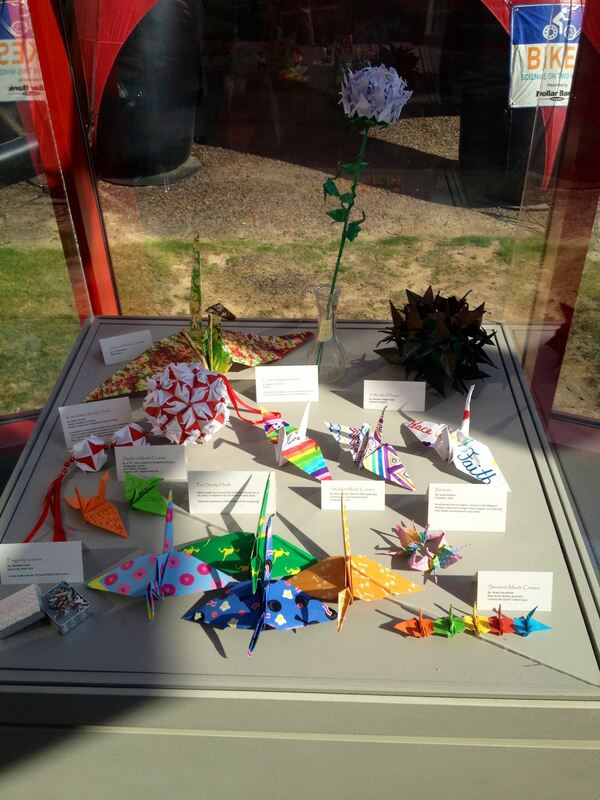 There is also a museum display case containing several of the origami projects sent in from around the world, including the original Kusudama Sandy Hook, created by Hungarian origamist Gabor Eszaki, Budapest, for Operation Sandy Hook; a stemmed chrysanthemum comprised of small cranes created by Magdolna Moholy, Hungary; a “crane chain” by Arwin Gensemer, President, Folding for Good 8, New South Wales, Australia; peace crane made with melted crayons and wax, created by E.J. DeGuzeman, President, Folding for Good 11, Kissimmee, FL; World of Peace, created by Dubrecen Origami Club, Hungary; colorful cranes created by Mrs, Charron’s Sixth Grade Class, Southampton, NY; a silver box of 26 mini cranes folded by Elizabeth Seay, NY; Renzuru, folded by Sylvia Niedler, Columbus, OH; and cranes with handwritten wishes by the 3rd-6th Class Students at Claregalway Educate Together National School, Claregalway, Ireland. 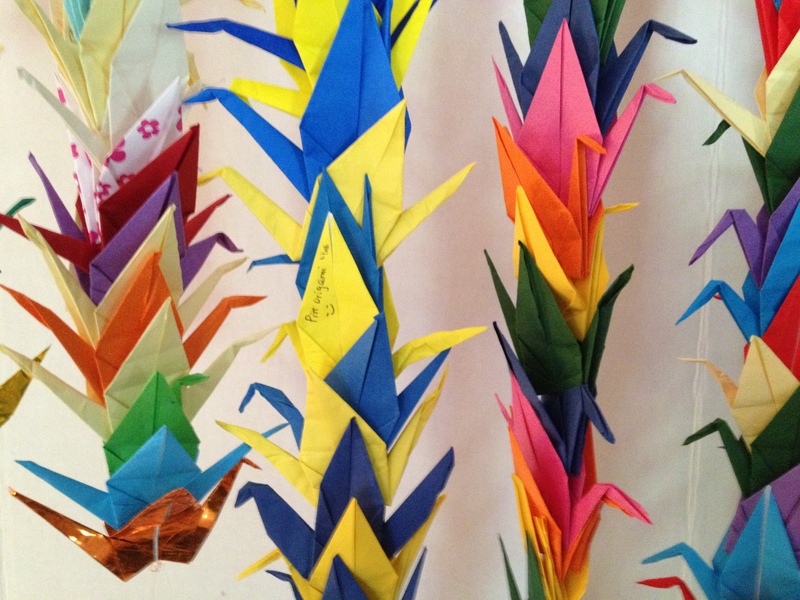 Also a special thank you to those who are coming out to teach the peace crane to Science Center visitors on scheduled Saturdays, including the Japan-America Society of Pennsylvania; the Origami Club of Pittsburgh; the Origami Club of the University of Pittsburgh; Western Pennsylvania Mensa; Owen Byrne, Folding for Good 9; Erica Manypenny and her team from PA Cyber; and Alex N., Wexford. It’s nice to Fold for Good with friends! This entry was posted in Math, Origami, Sandy Hook, Science, STEM, Uncategorized and tagged Calista Frederick-Jaskiewicz, Carnegie Science Center, Dubrecen Origami Club, Folding for Good, Gabor Eszaki, Hungarian Origami Society, Japan-America Society of Pennsylvania, KDKA-TV, Kusudama Sandy Hook, Magdolna Moholy, Magyar Origami Kor, Operation Sandy Hook: Peace, Origami Club of Pittsburgh, Origami for Africa, Origami Salami, Pitt Origami Club, Pittsburgh Today Live!.